Dr. Mark Saffman is a Professor in the Department of Physics at the University of Wisconsin-Madison. He received is B.Sc. with honors in Applied Physics from the California Institute of Technology. Mark worked as a Technical Staff Member at TRW Defense and Space systems and subsequently an Optical Engineer at Dantec Electronics Inc. in Denmark before going back to graduate school to earn his Ph.D. in Physics from the University of Colorado at Boulder. Next, Mark worked as a Senior Scientist at Riso National Laboratory in Denmark before joining the faculty at the University of Wisconsin, Madison. Mark has received many honors and awards during his career including the Vilas Associate Award from the University of Wisconsin, Madison, an Alfred P. Sloan Fellowship, as well as the Research and Creative Work and the William Walter Jr. Awards from the University of Colorado. In addition, he has been named a Fellow of the Optical Society of America and a Fellow of the American Physical Society. Mark joined us in this interview to talk about his experiences in life and science. For Mark, physics is a hobby as well as his job. When he’s not thinking about physics, Mark likes spending time with his family, including his young kids. Getting outside and enjoying nature is a great way for Mark to relax and unwind. Mark’s research focuses on quantum computing. Most people are familiar with things like computers and smartphones. Computing power has increased tremendously over the years by nanoscale fabrication in our electronics. We are now able to put more processing units on very small silicon chips, but the advances at this level are reaching their limits. People are now building computer chips so small that each device contains just a few electrons or atoms. At this very small scale, things work differently, and you can describe how they work with quantum mechanics. Mark and his colleagues are trying to build a new kind of computer called a quantum computer that can solve some types of problems that are unreachable for current supercomputers. A quantum computer uses individual atoms and has power that exceeds what you can do with known classical computing approaches. Though Mark grew up in an academic environment, and his father was a professor, he didn’t plan on becoming a scientist. In fact, Mark’s initial plan was to become an organic gardener on a commune after finishing high school in the 1970s. That plan didn’t work out, but Mark found that he was pretty good at science. After earning his bachelor’s degree, Mark wasn’t sure what he wanted to do next, so he decided to work in industry. Over the years, Mark worked on many different projects, gained experience, and began to identify the areas in science in which he was most interested. A desire for academic freedom to pursue the topics he was most curious about drove Mark to return to graduate school and seek a faculty position. Science is challenging because you are trying to answer questions that no one knows the answer to, and an answer may not exist. You have to get used to the feeling of not knowing what you are doing all the time. For Mark’s experiments, they need money to buy complex equipment and pay people working in the lab, so Mark spends much of his time writing proposals for research funding. This is a challenge because you put a lot of time into writing proposals that may or may not be awarded. When Mark first started on the faculty, he had a difficult time getting support for the research direction he wanted to pursue. He decided to change his research focus to quantum computing which was a new and growing area at the time. Fortunately, substantial resources have been dedicated to quantum computing research in recent years. About 6-7 years ago, Mark’s lab was the first research group to create a phenomenon called entanglement using atomic quantum bits (qubits). Entanglement is one of the building blocks needed to build more complex and powerful quantum computing devices. They conducted experiments where they trapped atoms, shined a laser on them, and got the atoms to interact with each other in a way that is strongly correlated. Work on this project began in 2002, and it wasn’t until 2010 that they were able to demonstrate entanglement for the very first time. It was really exciting and also a relief since they had spent so many years on the project. Mark travels to many different places to give talks and attend conferences. For him, part of what makes the travel great is the people you get to spend time with. Years ago, he attended a workshop on the island of Crete in Greece. They stayed in a hotel on the northern side of the island by the beach. It was amazing to go to breakfast, go for a morning swim in the ocean, attend conference presentations, talk about science with his colleagues, and then hit the beach again afterwards. The science at the workshop was excellent, and the location was a lot of fun. A large part of what makes science so rewarding are the interactions you have with colleagues, students, and competing labs. You meet many people who become your colleagues and friends. It is interesting because you see some of these people very infrequently (maybe only for a day or two every year or two), but you can always pick up where you left off because you have a shared interest in the science. Mark also enjoys a tradition of weekly lunches with his lab group near the lake on campus, and he occasionally has the group over to his house for a lab BBQ. It is easy to get stuck sometimes because something isn’t working that you think should work. You can’t keep doing the same thing and expect it to start working. You have to change something or do something different to get a different result. Also, find something that you are truly excited about, and pursue it. Don’t just follow a career path because other people are doing it, or because it is something you think you should do. Working in science is a wonderful career where every day is different, you can have fun, and it is extremely rewarding. 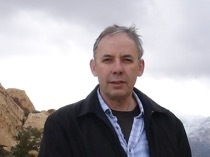 Mark Saffman is an experimental physicist working in the areas of atomic physics, quantum and nonlinear optics, and quantum information processing. He has made significant contributions to optical solitons, pattern formation, sources of entangled light, and quantum computing. His current research effort is devoted to the development of neutral atom based quantum computing devices. His research team was the first to demonstrate a quantum CNOT gate between two trapped neutral atoms, and the deterministic entanglement of a pair of neutral atoms. This was done using dipole mediated interactions between highly excited Rydberg atoms. He is currently developing scalable neutral atom platforms using arrays of trapped atoms. When not busy with physics he enjoys time with family, travel, and exploring somewhere far away from the nearest computer to enjoy fresh air and sunshine.